Obituary for Reginald J. Underhill | Adams Funeral Home Ltd.
With broken hearts, the family of Reginald John Underhill of Gray Rapids, NB, announces that he passed on to his eternal reward at Region 7 Hospital, Miramichi on Saturday, November 17, 2018 at the age of 85. Born in Barnettville, NB he was the son of the late Herman and Hazel (Astle) Underhill. In 1953 he married the love of his life, Jennie (Harris) Underhill. Together they had five children Lois (Kenneth) Sturgeon, Winsor (Marlene) Underhill, Nelda (late Dana) Sturgeon, Twila (Donald) Shaw and Velma (William) Ward. He was proud Poppy to Trent Sturgeon, Holly Grace, Andrea Sturgeon, Darla Crawford, Shonna Sturgeon, Miranda Underhill, Tyson Colford, Paula Colford, Gina Sturgeon, Jansen Sturgeon and Justine Jardine. He was Poppa Reg to Brennan and Alex Shaw. He was great grandpoppy to Keifer, Kiersten, Isaiah, Ryan, Emma, Breanna, Max, Lexie, Lauren, Lily, Daylen, Braxton, Lezley, Christian, Kyra, Cole, Chance, Cohen, Adalynn and Alayna. He will be missed by his four brothers: Shirley (Sally) Underhill, Leslie (Launda) Underhill, Clarence (Darlene) Underhill all of Blackville, NB and Daryl (Ellen) Underhill of Moncton, NB; seven sisters: Marie (late LeRoy) Underhill of Miramichi, NB, Margie (Doug) Murphy of Ottawa, ON, Eva Underhill of Kingston, ON, Vera (Eldon) Gillespie of Barnettville, NB, Mildred (late Jay) Ewen of Elliot Lake, ON, Lorraine (Howard) Walls of Calgary, AB, and Sandra (Lionel) Underhill of Halifax, NS; numerous nieces and nephews. 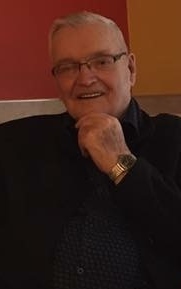 He will also be missed by his brothers-in-law: Harold (Norma) Harris of Gray Rapids, NB, Burpee (Olive) Harris and Keith Blakeney all of Fredericton, NB; sister-in-law Thelma (Herman) Sullivan of Gray Rapids, NB. Dad was predeceased by his beloved granddaughter, Darla Sturgeon Crawford; son-in-law, Dana Sturgeon; brother, Herman Underhill Jr. (Bunny); sister-in-law, Joan Blakeney. Dad loved his God, his wife, his children and grandchildren fiercely and there is nothing he wouldn’t do for any of us. When there was a need in the community he was always one of the first to respond. He proudly worked for M.F. Esson & Sons as a heavy equipment operator for over 40 years. Visitation was held at the Gray Rapids United Pentecostal Church on Monday from 2-4 & 7-9 pm and Tuesday from 12-2 pm. Funeral service was held from the church on Tuesday at 2:30 pm with Rev. Graham Russell officiating. Music for the service was provided by Janice Sullivan and Arlene Locke. The songs were "God on the Mountain" sung by Twila & Donald Shaw and "I'll Be Waiting For You" sung by Janice Sullivan. A Violin Solo "Amazing Grace" was played by Alex Shaw. Opening remarks was given by Daryl Underhill and Obituary reading was done by Marlene Underhill. Scripture reading was read by Winsor Underhill, a poem was read by Lois Sturgeon and the eulogy was given by Twila Shaw. Honorary pallbearers were Shirley Underhill, Leslie Underhill, Clarence Underhill, Daryl Underhill, Eldon Gillespie, Burpee Harris, Hazen Sullivan, Wesley Curtis, Keith Blakeney, Herman Sullivan, Lloyd Underhill and Wardie Underhill. Pallbearers were Trent Sturgeon, Jansen Sturgeon, Rodney Ross, William Ward, Darren Underhill and Jonathan Sturgeon. Interment will be in the church cemetery later in spring.